When Election Day Comes And There's Only One Candidate On The Ballot A political scientist says it's a bad sign for democracy when voters aren't presented with at least two options in a race. And the problem tends to get worse the further down ballot a race is. 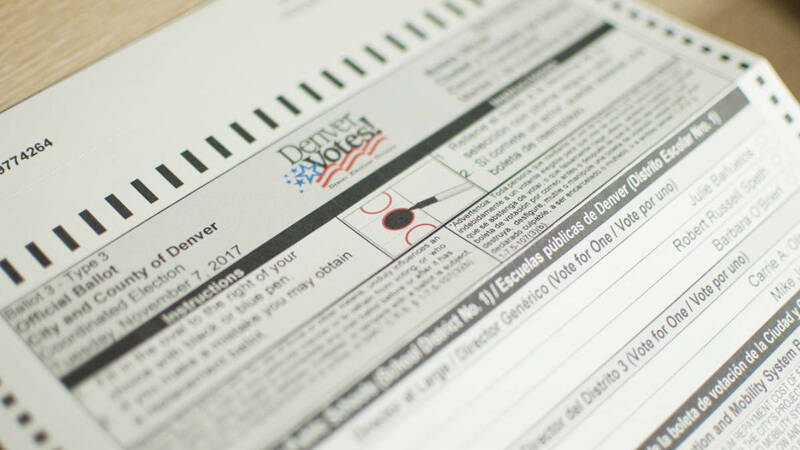 A mail-in ballot for Denver, Colo. There are local elections on Tuesday and there's been a struggle to find candidates to run in many parts of Colorado. Helen Webster wanted to be involved in the school district in her small town of Kremmling, Colo.
"I just felt bad that they weren't going to have anyone run up here," she says. So the retired teacher decided to run for a seat on the West Grand County school board. A current board member invited her to a meeting so she could get a sense of the workload. As she sat through all the presentations detailing next year's budget needs, it dawned on her. "I thought 'oh my God, this is more than what I bit off, I don't know that I could do that,'" she laughs. Right after the meeting, she called her husband and told him she was going to drop out of the race. Instead, another candidate will automatically be appointed to the board. The other three seats on the board that were up for grabs were also uncontested so the election was canceled, making Grand County one of six counties in Colorado to cancel an election this year. Grand County isn't the only place where there are public offices in search of candidates this coming Election Day. There's a decreasing willingness of citizens to serve in state and local government, says Adam Myers, a political science professor at Providence College who's studied the issue. "One of the big issues in state legislative races all over the country is uncontested seats," he says. "Roughly 35 percent of state legislative contests in the country are uncontested each year, so that's a very high percentage." Myers believes it's a bad sign for democracy when voters aren't presented with at least two options in a race. And he says, the problem tends to get worse the further down ballot a race is. "We don't have the same data on local races, but we have every reason to believe that the percentage of local races — so school board races, city council races, etc — that are uncontested is even higher." Myer says one of the biggest reasons people don't run for school board in particular is money. It's a volunteer office in Colorado, as it is in many other states. Myers' research shows that states with higher pay for elected offices tend to have fewer uncontested races. And when it comes to school board, not only is it unpaid, but it's also a lot of work. "I tell folks that we deal with people's tax money and their children, and so there's lots of emotion, lots of things attached to that," says Matt Cook, the director of policy and advocacy at the Colorado Association of School Boards. Cook says a variety of factors play into this year's high number of uncontested school board races. For one, almost all of the six counties that canceled elections this year are remote or rural places — places that have steadily bled population in recent years as many have left in droves for Colorado's larger cities. Another reason is the nature of the office itself, says Cook. School board seats — unlike other political offices — are a hard sell for people who don't have kids. "We know that there's about 80 percent of the state that doesn't have a direct connection to public education, either through a student in the district, a grandchild, aunt, uncle, nephew, niece, something like that," he says. "Often times it's hard for them to really see what's going on." When it came to Helen Webster, there was never any question of a connection to schools. She spent her career in them, from teaching English as a Second Language, to working with children with special needs, to even working as a receptionist in the front office. For her, it was the time commitment that was untenable. When the West Grand County school board began to discuss travel plans for a seminar, she knew she was out. "I had just started kidney dialysis, and trips are not a thing I can do," she says. Webster says she felt bad about pulling out of the race, but she says she did it because she didn't think she could give the position the time and dedication it deserved. It turned out no one else could either, aside from the candidate who will be appointed to the seat without earning a single vote.